I offer private 'one to one' and 'one to a few' music lessons along the Sussex coast and a little north of Worthing, Brighton & Hove, Lewes, Seaford, Eastbourne and Hastings areas. 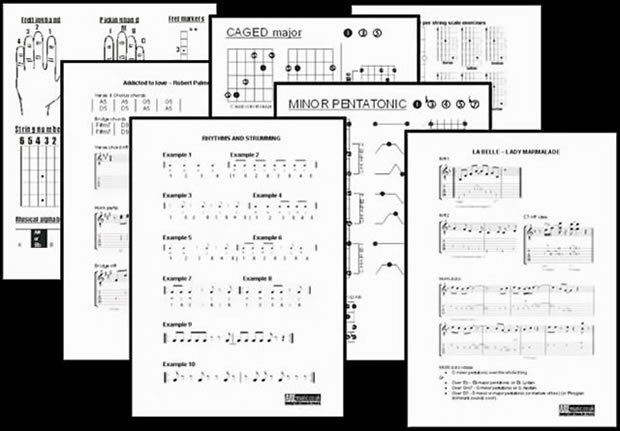 These are based around guitars and can venture off into various areas such as music theory, song writing, band skills and computer/mobile based recording. I teach all ages, abilities, styles and techniques. "Most of my lessons start with me asking Andy if we can have a go at a new song I have heard, so on goes the song and amazingly Andy writes down the chords as its playing maybe with a replay or two if the song has some unusual tuning or chords." Each individuals lesson will tend to vary depending upon what they want to achieve and I'm open to a lesson being from a question / answer style session, picking a tune and seeing where we end up or where we work on a set plan from myself. Beginner guitarist looking to knock out some chords. Hobby for child.....or adult reliving childhood. Advanced guitarist needing to tidy up skills to get into a music school. Singer wanting to accompany themselves. Songwriter needing a new writing tool. Band member wanting to tighten up playing and improve group. Ear training and working out songs from their recordings. Reading music - TAB / traditional notation. We can learn songs in a parrot fashion for quick results and enjoyment or go into more depth to understand the theory and techniques that make a song sound like it does. A more in depth approach can speed up learning, help to memorise parts and assist in the understanding of further songs. My music has always been partnered with computing and recording interests having been born into a household of guitars, 4 track recorders, keyboards, drum machines (and a tolerant mother). Hence I can support or focus some lessons on various music tech be it Apple with Garageband / Logic, PCs with Cubase or mobile devices and the plethora of music apps. Professional Development Certificate in modern music - Distinction. BSc in Computing with Mathematics. Apple Teacher with Swift Playground Recognition. Played guitar since I could hold one (~1984) - over 30 years of playing experience on electric / acoustic guitar and bass. Regularly performing, recording and song writing with live bands and artists (see gigs) locally and occasional adventures further afield including USA, Malaysia, Singapore, Belgium. Author of Xtreme Electric Guitar and Xtreme Acoustic Guitar tuition books/CD's- available in all good book shops. Writer of articles for Total Guitar magazine. Head of part-time courses at the Brighton Institute of Modern Music 2003/2004/2006, along with teaching group classes in guitar, live performance and running house bands. Private guitar teaching since ~1996 (full-time musician since 2002). "Without your input my son would not have developed the passion for guitar that he has and it has done wonders for his confidence. We feel very grateful to you for your fantastic support and the quality of your teaching. Now there's a testimonial for you!" For a collection of references please click the scrapbook and give the student pages a visit below. Rates 1 hour - £30, 45 minutes - £25, 30 minutes - £20. Flexible hours. Day / Night. Weekday / Weekend. Regular bookings welcomed e.g. once / twice a week / once a fortnight or I am happy to be called upon when the need arises*. Home visits along the Sussex coast and a little north of Seaford, Worthing, Brighton and Hove, Lewes, Eastbourne, Hastings areas or come to my home studio in Hastings. Visits further afield can be arranged at an extra travel charge. Something a little noisier can be arranged at Monster Studios near Hove lagoon where we can make use of their soundproofed rooms with PA, drums and amps for a share of the room hire fee. Option to meet up for a free chat / strum to see if I can help. Olly - 5 Years of guitar lessons and now off to City College Brighton to study a BTEC in Music (Performing / Composing). Joe - Grade 7 Electric guitar Merit. I can also recommend teachers of other instruments.